Yes, that's right, our macro friends at ABI have cleared the way for 7-oz. bottles of Budweiser Select 55. Bud Select 55 is the lowest-calorie beer on the market, at (yes) 55 calories per 12-oz. serving. Simple division (or multiplying by fractions!) gets us 32 calories in the smaller "nip" bottle. Yes, the design is dumb. It's bland, boring, macro. The only interesting thing is the watermarked crown on the backdrop, but it looks closer to a cheap 40 than a select anything. So there's that. 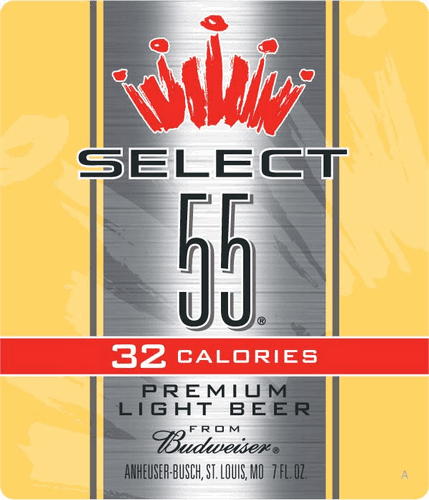 But more importantly, the feeling one gets from taking a quick look at this label is that the name of the beer is "32 Calories." It's in white on red, and by far the brightest and most prominent element. By comparison, "select" is black on gray, in boring font. The focus of this beer's identity is not even that it's beer. Which is, I guess, good, because you probably can't get drunk on it. Calories in beer come from the same place as the alcohol, so when you make a beer with 55 calories, you get something that clocks in at about 2.4% ABV. At which point, you're going to consume a whole ton just to feel a buzz, and (while I haven't had it), my guess is that we're not swilling this for the taste. Trying to consume a beer that low in ABV in tiny bottles makes less than no sense, and would be dumb even if the bottles weren't called "nips." If you're that concerned about calories, order yourself a Diet Coke (or better, a water), and save yourself the trouble. In the post where this label was approved, Adam Nason mentioned the possibility of a synthehol zero-calorie beer. I'm officially rooting for that, so we can get this off the market. Another disappointing piece from the week comes to our attention via Joe Stange's blog Thirsty Pilgrim, which tells us that the famed monks of Westvleteren will actually sell about 100,000 bottles of their rare and sought-after XII beer on shelves this year to fund an expansion for the abbey. Okay, so Westy doesn't need to have good design. The name alone will ensure not just a sellout but a robust arbitrage trade on Ebay and similar sites, along with a thriving gray market economy. So they're probably right not to worry too much about it. All that said, this is really lame. Stones, an overdone medieval font, and pointed arches to look at bottles. The simple bottle art is nice and classic, but the packaging is quite banal. 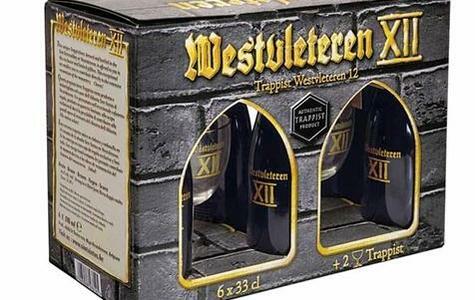 I mean, you guys are Westvleteren, the most storied of the Trappist brewers! Give me something that looks different from every other Christmas or commemorative beer box set. Just a gorgeous soft blue-green color for the background, complete with brushstrokes and gradients to keep it from becoming too monochrome. The disappearing bride is festive and a great way to introduce a ribbon (ever notice that most ribbons are floating in space for no reason at all?). The font matches the classy, vintage style. That ribbon extends into the interpretation text, keeping it connected in a way that most labels don't. It's actually a bit of a theme here, as no border element on the label is strong or even uninterrupted, and none of them overpower for even an inch the dominant color field that forms the background. The runner along the bottom helps unite the whole thing. Very nice piece, all in all. The Westy packaging makes me angry. There is a real lack of thought and care over here in Belgium when it comes to beer graphics. Being a designer (not graphic but product designer) and beer lover it feels like a kick in the nuts when things like this happen. Yeah, Belgian beer seems to be a bit like French wine when it comes to design, which is to say they seem to feel that quality design implies a lack of tradition. Seems to be changing as markets open up, but it's rough to see a once-in-forever opportunity for Westy just squandered.